Rosso Restaurants, a much loved place with sporting stars and celebrities alike, a firm fine dining favourite within Manchester’s bustling food and drink scene, launches their new Bubbles champagne menu. 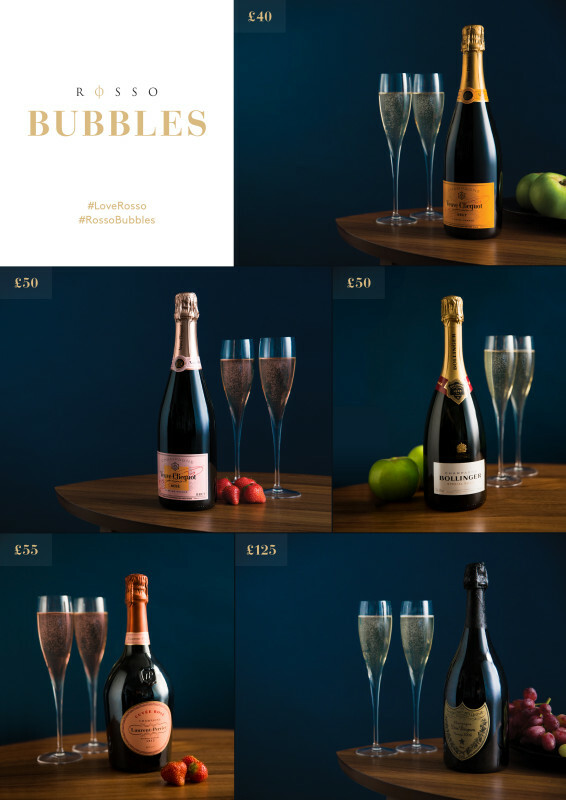 ‘Bubbles’ a new champagne drinks menu at Rosso Restaurants follows the phenomenal success of the #ChampagneSummer menu, showcasing great champagnes at truly incredible prices. Over 4000 bottles were enjoyed by guests throughout summer. Rosso Restaurants is well known for providing an excellence dining experience which is also backed up with a fantastic champagne offering, which can either be enjoyed while dining or just for relaxed drinks. The new Bubbles menu features champagnes such as Veuve Cliqout Yellow Label £40 and Bollinger £50 along with higher end champagnes such as Laurent Perrier £50 and Don Perignon £125. Guests are welcome to kick back, enjoy the festive surroundings of Rosso Restaurants whilst enjoying fine champagne. A taste of true luxury that is purse and wallet friendly. Rosso’s vibrant bar houses a unique, hand selected spirits wine and beer collection which is rivalled by few out of London. The team at Rosso Restaurants look forward to sharing their new Bubbles champagne menu with old and new guests alike. The bar area at Rosso Restaurants can now also be booked for events & meetings please call the team on 0161 832 1400. Rosso Restaurant, located at 43 Spring Gardens, is a 116-year old Grade 2 listed building set in the heart of Manchester – owned by international footballing legend Rio Ferdinand. Rosso Restaurant boasts a 150-cover restaurant and bar where guests can step into a world where timeless elegance meets contemporary luxury to the backdrop of a marble and mirrored interior. A wide selection of fine seasonal Italian menus coupled with one of the finest rare spirit and wine collections outside of London. Rosso Restaurant provides true Italian luxury and panache. For media / PR enquiries, please contact Holly on Holly@rossorestaurants.com or call 07734 061041. Press release and images courtesy of the Italian Restaurant Company Ltd c/o Rosso Restaurant. Rosso Restaurant provides true Italian luxury and panache.